If our physical body so desperately needs to release, surely the law must be consistent for the whole soul. 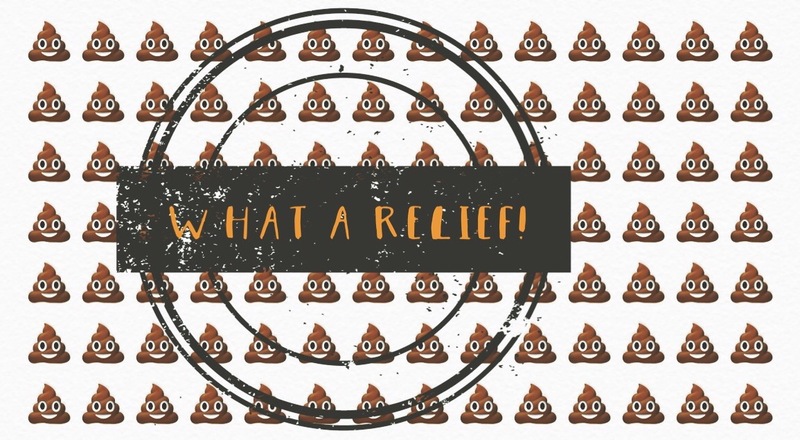 I remembered being a child and laughing hysterically with my best friend at the phrase, “What a relief!” in response to having a nice long steamy piss. But all this relieving eviction of body product got me to thinking…if our physical body so desperately needs to release, surely the law must be consistent for the whole soul: emotions, spirit and psyche. Have you ever tried to hold your pee when a convenient toilet escapes you? Perhaps you’ve experienced the horrifying “prairie-dog” effect when your body just can’t make the dog stay in the hole. For the love of all things holy, why can’t the careful walk to the toilet also be the swiftest? The gush of blood when you just weren’t prepared. Eating that one wrong meal and you can’t keep the food down. And don’t your eyes pop out of your head if you try *not* to sneeze or do it with your eyes open? Or worse yet, martyring yourself trying to hold your gas for mutually the fear of embarrassment and the olfactory safety of your neighbors, but you finally reason with yourself to free the trapped air and your heart sinks into your pants when you feel that it’s actually a shart? Please, dear God no! It is nothing short of torturous misery to try and hold in vomit, poo, pee, gas, or a sneeze – and it is equally all things glorious to release them. Heaven bless the perky rebound after throwing up too much alcohol or a disagreeable dish. Freedom. The cosmically orgasmic sneeze when our bodies reject a sinus intruder. Yes! More! Finally taking that Austin Powers-long pee after a good night’s sleep. Hallelujah! Making it to a toilet when your intestines have had enough. Pure ecstasy! Feeling your body deflate five inches once you release a massive gas pocket. Slow, wordless smile. Fire is a timeless symbol of not only power and passion but also equally life and death. The phoenix sets itself ablaze only to rise from the ashes again. Burning incense is a universally sacred practice. Two ways to burn yourself clean: first, sage. Smudging is another ancient practice of purifying space, energy and literally the air around you by smoldering leaves or sticks. The second is by naming your filth – write a letter to someone you need to forgive, write down the missteps that are anvils to your soul. Maybe it will be paragraphs; maybe it will be pages. Write it all down, weep over it, and then light it up and let it go…safely of course. Nothing says out with the old like in with the new. The order doesn’t matter. Sometimes the arrival of something new can push the old aside. Other times, you’ve successfully eradicated your spirit gunk and although its exit is healthy, you’re left with a void of what was. Cleansing yourself through newness can be anything – something powerful that you create, design, develop; a therapeutic shopping spree to signify change; the first ceremony of a new tradition; moving or relocating to start anew in a new place; find a new way to give back to the community. Dumping your spirit’s waste in this way can be your renaissance. This is my personal self-care favorite. Being. As an extrovert, I tend to find my energy among people, but I also have introvert tendencies and need to indulge in delicious hermit-like moments to find my balance. Part of my soul-cleansing process includes quality alone time. This isn’t the avoidant type of me-time that includes eating comforting lime chicken or steak tacos (La Pasadita is the best – corn tortilla, onions & cilantro) on my couch in droopy sweatpants I’ve had since high school and watching made-for-TV movies from the 90s (you know the ones with Tori Spelling and Joanna Kerns…). Although these moments feel GREAT, I mean the actual art of being. Unplugging, looking inward, opening your soul to let go of the old and bad and ugly, and welcome in love and compassion and light. Meditate, pray, go to a sensory deprivation chamber, go off the grid for a few hours – heck, try a whole week! Delete the site history of the internet browser that is your soul and refresh your deepest core. If you have more tips – or have particular success with any of these, please write to me and let me know. Let’s continue the upward trend of healthy release. What. A. Relief.